Dr. Polkinghorn, MS, MA, MPhil, Ph.D., is a Distinguished Professor of Conflict Analysis and Dispute Resolution. Since 2000 he has been the Program Director in the Department of Conflict Analysis and Resolution and Executive Director of the Center for Conflict Resolution (CCR) at Salisbury University. Prior to 2000 he was the senior faculty member in the Department of Conflict Analysis and Resolution, Nova Southeastern University. He has worked in the conflict intervention field since 1985 as a mediator, arbitrator, facilitator, trainer, researcher, academic program developer, conflict coach, dispute systems designer and ombudsman. 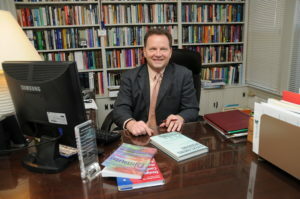 His primary research and publications are in the areas of environmental disputes, graduate program developments in the English speaking world, post conflict development projects, conflict intervention programs, ADR court program assessment and, the evaluation of major government ADR programs. He has published over 40 articles, book chapters and edited books and been the principle investigator or recipient of more than 60 grants. He has practiced in more than a dozen countries primarily in the areas of environmental policy dispute intervention, labor-management. cross border cooperative enterprises, support of peace talks and civil society training. He is currently facilitating dialogues between Palestinian, Jordanian and Israeli parties on water rights/usage, waste to energy and collaborative agricultural in the Jordan River basin. He has also worked on the peace process in Nepal. Brian is an alum of the Institute for Conflict Analysis and Dispute Resolution (ICAR), George Mason University (MS, Conflict Resolution, 1988) and the Program on the Analysis and Resolution of Conflicts (PARC), Syracuse University (MA, MPhil, Ph.D. 1994). He was also a Fellow with the Program on Negotiation (PON), Harvard University Law School (1991-1992), a National Fellow with the US Environmental Protection Agency (1991-1993), a United States Presidential Fellow (1991), the University System of Maryland Wilson Elkins Professor and more recently a Senior American Fulbright Scholar with the Evens Program in International Conflict and Mediation at Tel Aviv University (2010). Designed and launched two doctoral, three masters and one bachelor degree programs in conflict analysis and dispute resolution. Visiting distinguished scholar to programs in Asia, the Middle East, Europe, Central America and the United States. Has designed and taught 37 different graduate and 24 different undergraduate courses. Recipient of major teaching and public service awards including Senior American Fulbright Scholar to Tel Aviv University in Conflict Resolution and University System of Maryland’s Distinguished Public Service Award. Recipient of more than 60 grants. Principle or co-principle on major research in the areas of conflict intervention, process and program evaluation. Published results of field research in several tier 1 journals. Received several research awards from state and federal agencies as well as professional organizations. Accomplished practitioner of numerous conflict intervention processes. Mediated several thousand cases ranging from domestic to international disputes; arbitrator in public and private sector, group facilitator of domestic and international disputes and, conflict resolution program developer for local, state and federal level agencies. Considerable conflict intervention activity in: South Africa, Israel, Palestine, Nepal, Bosnia, Columbia, Northern Ireland.